Divest UW | If it's wrong to wreck the planet, it's wrong to profit from wrecking the planet. We are continuing the call on UW to divest from fossil fuels in line with a safe climate and to increase their investments in clean energy. At the same time we are working with the university to engage in shareholder advocacy work, particularly focused on banks that finance dirty fossil fuels. Related to our shareholder advocacy, we are also helping lead a campaign to get the US Bank to stop its billions worth of financing of harmful coal mining, mountain top removal, fracking, and tar sands projects. We are also currently in discussions about hosting the Pacific Northwest Fossil Fuel Divestment Convergence – a gathering of divestment activists from across the region to help build, train and grow the fossil fuel divestment movement. Apart from our own campaigns, Divest UW is continuing to work with the broader climate community on important climate justice struggles. Divest UW is working in partnership with climate justice organizations to put a price on climate change-causing carbon pollution in Washington State. A carbon tax is one of the most powerful tools in the fight against climate change and implementing one state-by-state is currently the most feasible route given DC grid-lock. Check out this great piece by John Sutter about I-732 for more details. We will also continue to partner with local climate justice organizations to take part in the fossil fuel resistance. We have been involved in the Shell No campaign, Keystone XL fight, oil trains resistance and we will continue to be involved in the fossil fuel resistance moving forward. 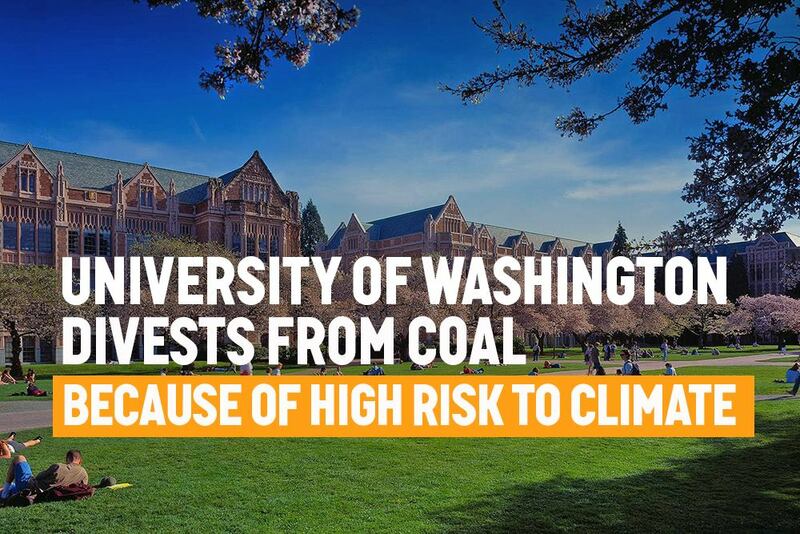 If you haven’t heard the good news, on May 14th the University of Washington divested from thermal coal, making us (at the time) the richest public university and the school with the biggest student body to divest! A big thank you all of our supporters who helped get us to the point where we could make this significant victory. (We hope to have a big celebration with you soon, probably after exam time). We put a lot of work into educating the regents on the issue which eventually led to them voting unanimously in favor of thermal coal divestment and we thought it would be good to share some of our materials. Firstly, here is a our initial case for coal divestment, here is an addendum, here is a summary we gave of the financial analyses for divestment, here was the case we gave for full fossil fuel divestment, and then finally here the last piece we gave to the regents to convince them they should divest from coal when we found out that they were unwilling to go all the way on full fossil fuel divestment. We are excited about our divestment win, and we are looking forward to building on that success to continue to grow the power of the climate justice movement! More details of how we aim to do so soon. The University of Washington could become the largest university to divest from fossil fuels! Contact the Board of Regents: We need the Board of Regents to know that there is support for this proposal, so what better way to let them know than to contact them. Call them on 206-543-1633 or email them at regents@uw.edu (You can even find individual regent contact details here). You can find some talking points for coal here and reach out to them in whichever way suits you best. Why not send the regents a photo pledge not to invest in UW until they divest like Seattle City Councilmember O’Brien did? 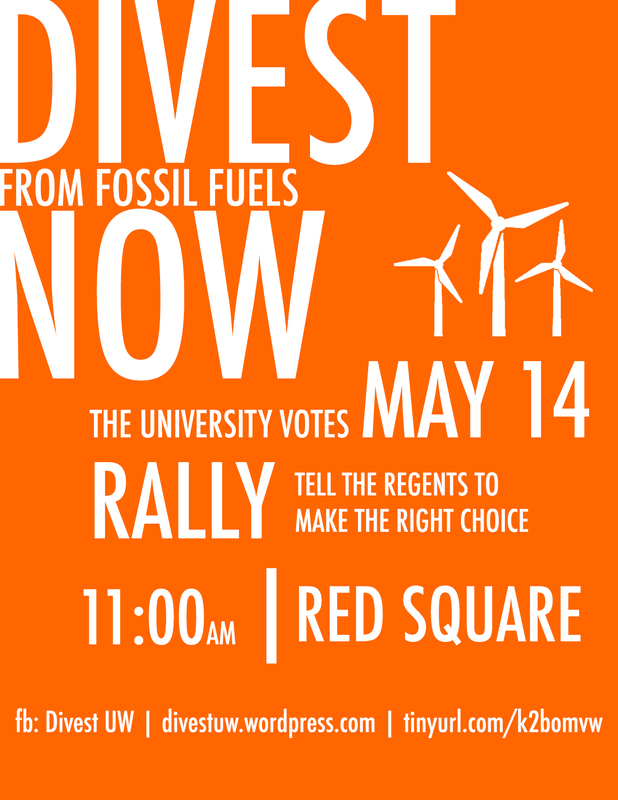 Or why not share a photo in support of divestment on the UW Facebook wall or tweet it at them? Join us at the Rally and the Board of Regents meeting: The meeting is on the 14th of May and it would be great to fill the room with support. We will be holding a rally in Red Square at 11am with the vote set to take place at 11:45 in Gerberding Hall 142. Please join the Facebook event and start spreading the word. Get the Word Out to Friends and the Press: Please invite all your friend and spread the word. If you are part of the press or know press willing to cover the story, we have a press release here. Friends, the power of the divestment movement is growing, and the UW can be the major leader that the movement has been waiting for. Let’s provide them the support to be able to do so. forward! After so many months of working to have the opportunity we were very excited to spread some divestment knowledge. The regents seemed generally receptive and things are looking up for the future. 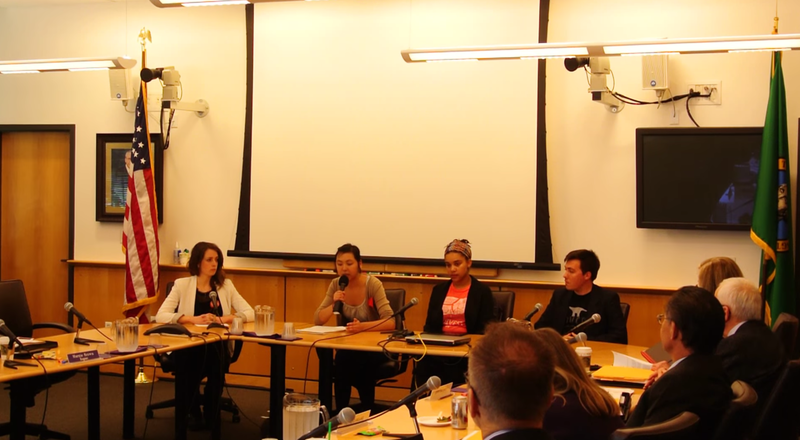 (You can watch the video of March’s Board of Regents meeting and our brave speakers here). Currently, Divest UW has been focusing our energy on securing a vote on the May Board of Regent meeting agenda. In our current talks with the administration it is looking very likely that thermal coal divestment will be an addendum to the general financial motion! In other words, we could get a vote (and a win) at this meeting! we are excited to step it up to the possibility of being the biggest university to divest from fossil fuels! Thanks to all our supporters, for helping us build a serious force in the UW community. To those who want to get involved: there is no better time than now! Let’s tell the university once and for all, the time to divest is NOW. After tireless campaigning it looks like the big day is upon us, [drum roll please]. Contact the Board of Regents: We need the Board of Regents to know that there is support for this proposal, so what better way to let them know than to contact them. Check out their contact details here, find some talking points here and reach out to them in whichever way suits you best. Reach out to Alumni and Faculty: We have built up great support from the student body, and now we’re asking for your help to reach out to faculty and alumni. We’ve created a petition for faculty and one for alumni. Join us at the Board of Regents meeting: The meeting is on the morning of the 12th on the Bothell campus and it would be great to fill the room with support. The meeting time is at 10:50am, possibly subject to change. The details will be posted here by the 6th of March and we’ll send them out when we get them. Sign up for Public Comments: There is a public comments section at the beginning of the meeting. Sign-up opens on Friday the 6th of March at noon. If you can make it and give a two minute speech in support of the Divest UW proposal, then please sign on for public comments here when applications open. Friends, the power of the divestment movement is growing, and the UW can be a leader. Let’s provide them the support to be able to do so. One of our great alums recently put together a petition for alumni to sign on in favor of the university divesting from fossil fuels. If you’re an alum please sign on and spread the word to other alums too. The alumni voice is a powerful one in helping influence the university so we are going to use it as best as possible. Faculty across the country are signing on in favor of universities removing their investments in the harmful fossil fuel industry. On behalf of Divest UW I would like to humbly request your endorsement on the attached faculty and staff petition in favor of the University of Washington divesting from publicly traded companies whose principal business is the mining of coal for use in energy generation. This petition aims to inform the Board of Regents who are set to potentially vote on divestment at their March meeting. The call already has the support of the Associated Students of the University of Washington and the Graduate and Professional Student Senate. We would greatly appreciate your and other faculty support too. If you are happy to endorse the call, please can you email your name and title to <ccchange@uw.edu>. Also if you are willing please can you send this petition onto other colleagues, faculty and staff at the University of Washington. If you have any questions. Please do not hesitate to contact <ccchange@uw.edu>.